Tropical Razzles is it candy or gum ? Tropical Razzles gum in 5 fruity flavors from the tropics. This tropical bubble gum is the newest flavor in the razzles candy line. Kiwi-Lime, Pineapple, Strawberry-Banana, Tangerine, and Tropical Punch. Each box has 24 packages. 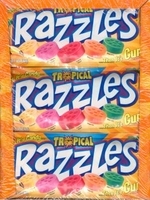 You can also buy just one pack of tropical razzle if you want to give them a try first.